Welcome to What Meegan Makes. If you are new here, welcome! If you are a faithful follower, thanks for stopping by today. I always appreciate it. If you know me at all, you KNOW I love book page crafts. Today I am happy to share my Spring Book Page Art with you. One that is both easy and perfect for your home all year long. I have many book page crafts around our home. You can find most of them right here. I started out by tearing my book pages out of the books. I like the torn edges and the rough look for my book page crafts. But you can do it anyway you like. After all it is YOUR Spring Book Page Art, right? 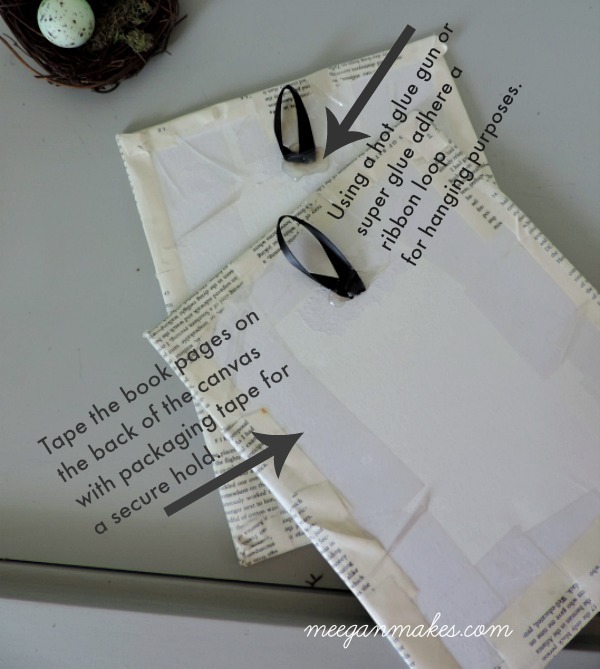 Mod podge your book pages to your canvas. I used 2 coats to make sure everything was covered. I then let it dry for 18 to 24 hours. 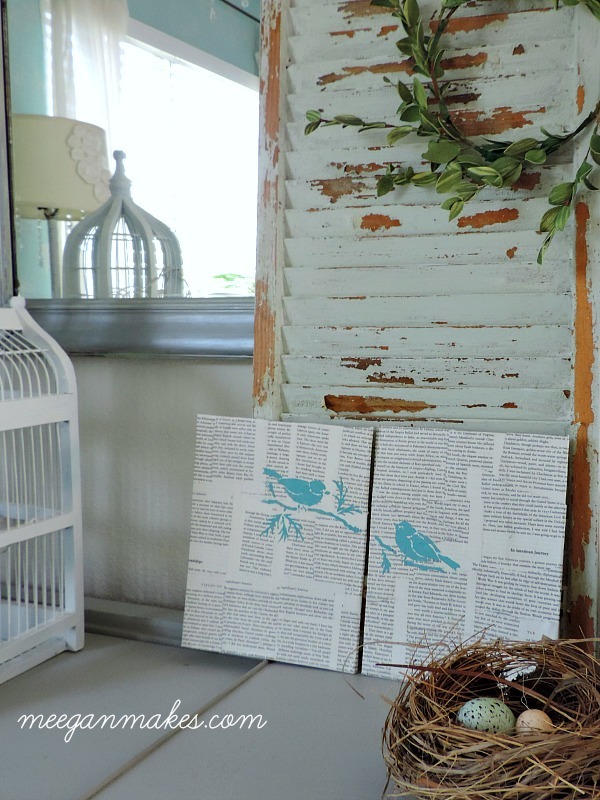 Once it was dry, I was ready to stencil my birds with craft paint. I like the idea of the birds facing each other and the branch looking like it was attached. But again, it is your choice. When the paint was completely dry, I adhered my ribbon with hot glue. Some of you might using super glue better. Either one will work. Taping the book pages to the back was super easy. I thought about using decoupage to adhere the pages to the back but it wasn’t going as smooth as I has hoped. So that is why I used the packing tape. I hope you try making Spring Book Page Art soon and let me know how it goes. I would love to hear all about it. While you are here take some time to visit more Spring inspiration-Several of my blogging friends are sharing their Spring Ideas, too. You will be inspired to make and create your own Spring creations. Again, thanks for stopping by and letting me share my Spring Book Page Art. 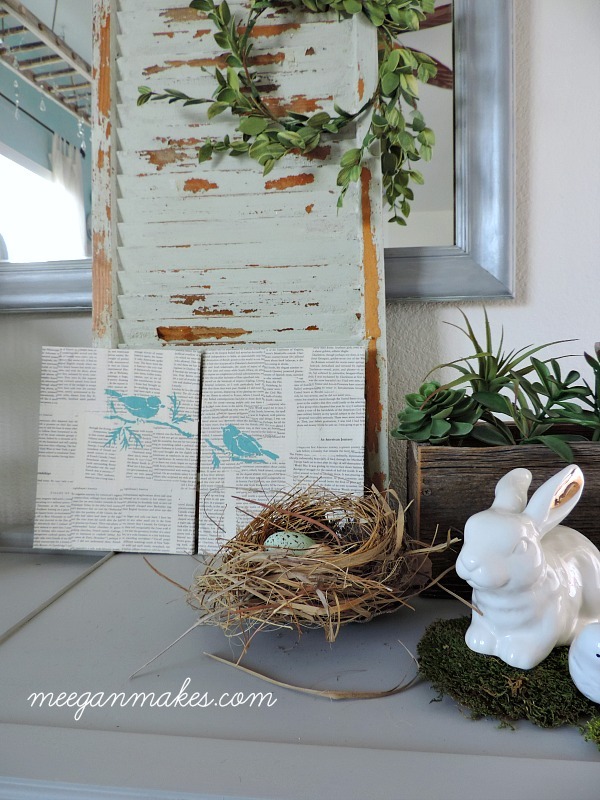 Perfect canvas project for spring! Love it! So pretty, Meegan! 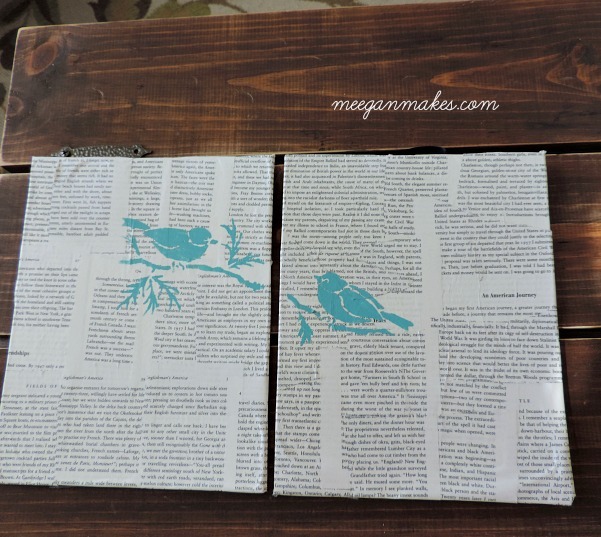 I adore the book page look, and the stencil is icing on that gorgeous cake! These turned out great. In fact, I love the whole vignette. 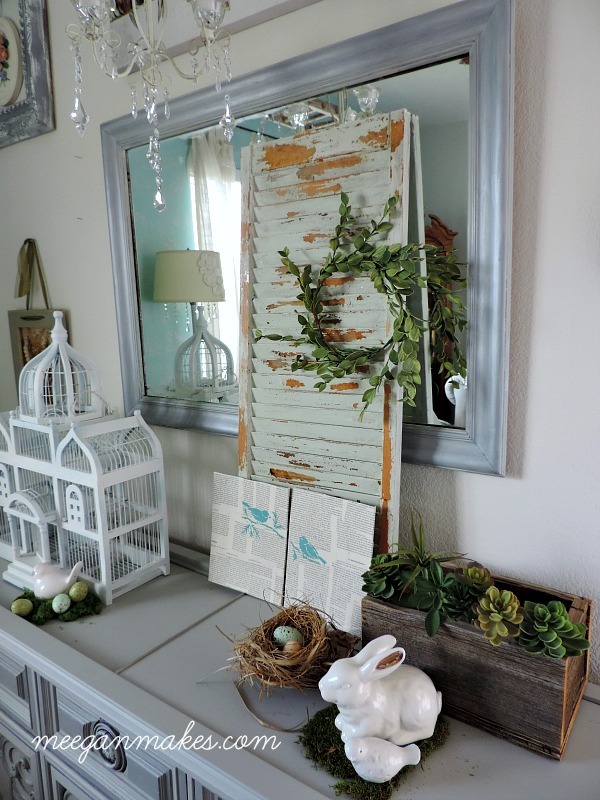 You have a knack for creating the prettiest spring decor! Love it, Meegan! I adore this idea. The pop of color from the birds is perfection. Love the nest too. Great Spring decorations. Spring does make me think of birds. Good Morning Meegan…what a great project. So unique and fun…and spring-y! So now you’ve got me thinking about book page projects…something new I think I need to try. And that shutter…just beautiful. I’m sure it’s fun to decorate around it. Oh how lovely! What a beautiful project- I love your mix of text and bright blue birds. Your display is so springy and elegant! I love anything having to do with book pages, so as soon as I saw this, well it had won my heart. The birds are such a lovely touch. Thanks so much! I love your comments. 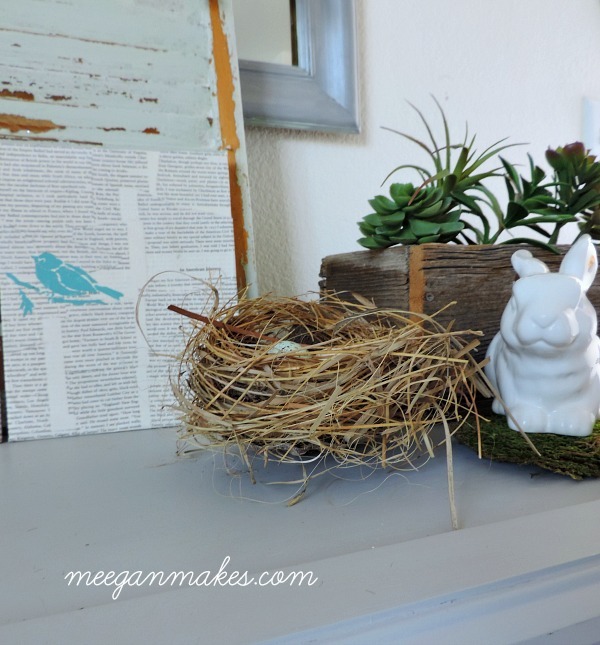 Book page projects make me swoon Meegan and I totally love the simplicity of this one. How clever you are!! Thank you for sharing this fun project at Shabbilicious Friday. I’m delighted to be featuring it in the line up of spring projects at tomorrow’s party. Thank you so much, Kerryanne for the feature. I love your blog and your party. I am honored to be featured there.